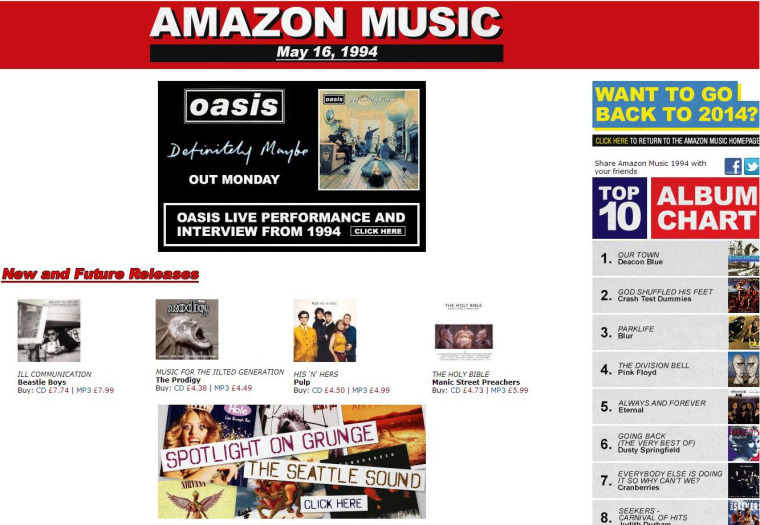 Amazon U.K.'s music page dialed back to 1994 on Friday to celebrate the 20th anniversary of the Oasis album "Definitely Maybe" -- and the result is absolutely awesome. The Brits at Amazon launched the stunt mainly to show off exclusive videos from the early days of Oasis -- but the feuding Gallagher brothers and their bandmates aren't the only throwbacks on the page. Other gems include "new and future releases" from '90s icons including Beastie Boys, The Prodigy, Weezer and Jeff Buckley. Crash Test Dummies and Abba ruled the top 10 album chart, and the top tracks section features R. Kelly's "Bump N Grind" and Counting Crows' "Mr. Jones." To look the part, there's a handy link to '90s wear (think plaid button downs and Doc Martens). Oasis' home country is the only version of the site featuring the retro page, but Americans would be forgiven for getting confused -- the current U.S. Amazon music page includes new and upcoming releases from Billy Joel, Michael Jackson and Dolly Parton.